Latourrette Consulting continues to develop ties in the LATAM market with another successful event, now for the first time in Bogotá - Colombia. 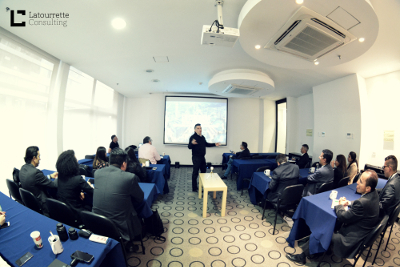 After the success in São Paulo - Brazil, in October, Latourrette Consulting organized for the first time a business meeting in Colombia, dedicating a full day to our partners and clients at the Hotel TRYP Wyndham Embajada. Together with Kofax, we presented our Master VAR partnership with several presentations being realized by international specialists of the two companies that addressed the newest services and opportunities available to partners and their clients throughout Latin America, as well as presenting special conditions offered by the Latourrette Consulting and Kofax partnership.